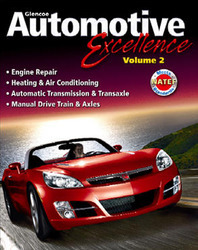 Prepare your students for ASE Certification with Glencoe Automotive Excellence Volume 2! All key technical skills are covered as Math, Science, and English/Language Arts skills are integrated to help create a class curriculum that meets Perkins legislation requirements. Volume 2 covers: Engine Repair, Heating & Air Conditioning, Automatic Transmission & Transaxle, Manual Drive Train & Axles. Automotive Technician's Handbook addresses ASE certification, the automotive industry, safety practices, and tools and equipment. Section objectives are coded to NATEF Standards. ASE Test Prep questions are included at the end of each section and chapter. Excellence in Math features link automotive content to key math skills and prompt students to Apply It! by solving problems. Excellence in Science features link automotive content at "point of use" to key science concepts and then ask students to Apply It! by performing a hands-on experiment. Excellence in Communication features connect automotive content to key reading, writing, speaking, and listening feature and then ask students to Apply It! Safety First highlights issues that warrant concern about safety on the job. Tech Tips provide useful information that helps technicians perform automotive tasks. Volume 2 has 736 pages.